Located 50 km northeast of the Qianxi County town is a unique submerged section of the Great Wall. Xifengkou Pass and the Panjiakou Pass were submerged as a result of the construction of the Panjiakou Reservoir in 1975. Here the wall enters the water from the east bank of the reservoir and surfaces on the west bank, to continue its journey. The crystal-clear water mirrors the surrounding mountains, the clouds and the sky, making a beautiful scene considered a combination of the majesty of northern China. The Great Wall stretches westward at Xifengkou Pass, winds up Panjiakou Pass gate and leaps onto the steep mountain. Panjiakou Pass, closely adjoining Xifengkou Pass as lip and tooth, was attached great importance by the rulers of the past dynasties. At the end of the Ming Dynasty, Qing soldiers made an attack on the capital of the Ming Dynasty by breaking through Panjiakou and other passes from the side wall of Xifengkou Pass before Qing Dynasty Was established, which caused a great panic among the rulers and the public. Panjiakou Pass was called Lulong Fortress in the past. Caocao of East Han left for the north from here to fight against Wuhuan. "Depth of the frost and hues on the armor, aged the war-horses are growing. Floating the flames of battles, still on Lulong Fortress.” These last four lines of the poem “A song on the Fortress " by Rongyu, a poet of the Tang Dynasty show that armies always garrisoned this place and wars never ceased. It’s said in the Song Dynasty, Panjiakou was named after a general named Pan who was garrisoned here with his family. The new Panjiakou pass was built during the reign of Jiajing in the Ming Dynasty, through which the Luan River runs into Panjiakou. It was strategically important and dangerous with two precipitous rocks standing strategically on the banks of the river. The nearby walls of different shapes wind up the ridge. On the mountain over ten watchtowers stand facing one another and gaze defiantly at the sky. The Panjiakou reservoir was built by the government in 1976 to draw water into Tianjin City. The unique spectacle of "the Great Wall under the water" was created when the water was infused into the reservoit, ran across the Great Wall and submerged Panjiakou Pass, Xifengkou Pass and nearby walls. 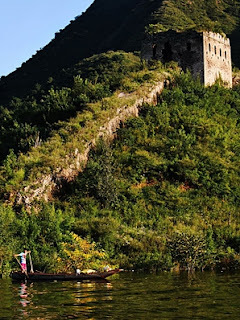 The view of the flickering ancient Great Wall between mountains and blue waves, the straight isolated watchtowers and beacon towers on the peaks and the green ranges of hills on the banks can be rated as Three Gorges of the North China and Li River of the northern Hebei. However, sharp drop of the reservoir's water level because of drought brought it above the water at the end of the 20th century. Recently, parts of the Great Wall, which emerged out of the water, were submerged again due to the ecological improvements and sufficient rainfall. Jiangwen, a noted film star filmed a picture named "The Japanese Invaders Are Coming" at the foot of the ancient Great Wall. The winding Great Wall and the quiet and beautiful fishing village made it one of the ten most popular film locations of China.